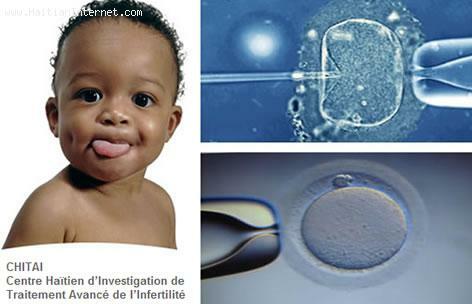 Haiti Health News -- In-Vitro fertilization is now a reality in Haiti. Haitian doctors have just given birth to two newborn babies, in Port-au-Prince, both from In-Vitro fertilization. I bet you didn't know that Haiti has a "Center of Investigation and Advanced Treatment of Infertility" did you? Haiti Chanje wi... LOL... L'ap tann ou! Initiative of a group of Haitian doctors, specialists in infertility, CHITAI in partnership with Duke University offers an alternative to the thousands of men and women who will no longer have to leave the Haiti for treatment in a foreign land. CHITAI has a very bold objective: They want to "become the best treatment center for infertility throughout the Caribbean, according to HaitiLibre.com. I could use such center. I m Gina I live in New York and My husband living in Haiti. please contact me with prices.